Preheat oven to 350 degrees. Grease a 9-x 5-inch loaf pan with cooking spray. In a small bowl, using a fork, mash the bananas. You should have about 1 1/2 cups of mashed bananas. In a separate bowl, whisk together the all-purpose flour, whole wheat flour, baking powder, baking soda, salt, nutmeg, and nuts. Set aside. In a large bowl, whisk together the eggs and stir in the brown sugar, canola oil and milk. Add the dry ingredients in 3 batches alternately with the bananas, beginning and ending with the flour mixture. Stir each addition gently with a rubber spatula just until the ingredients are incorporated. Your batter should be slightly lumpy. Pour the batter into the prepared pan and smooth the top with the rubber spatula. Bake until a tester inserted into the center comes out clean, 55-60 minutes. Transfer to a wire rack and let cool in the pan for 5 minutes, then turn it out onto the rack and let the banana bread cool completely before slicing. adapted from Williams-Sonoma Essentials of Baking by Chuck Williams, ed. 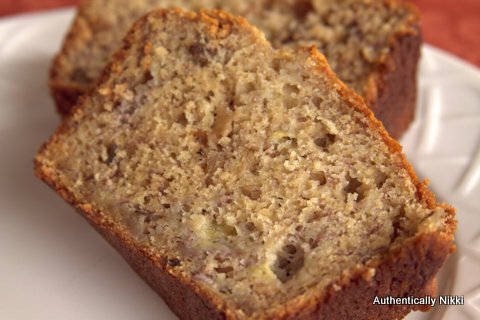 This entry was posted in Muffins and Quick Breads and tagged bananas, quick bread by authenticallynikki. Bookmark the permalink.